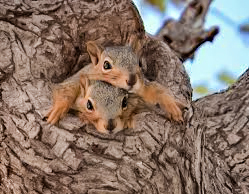 There were only two squirrels in the trick nest. But they had the most important job. They had to time things just right. But they were ready. They pulled the latch! All of a sudden, a million acorns fell on top of the Hawk-Devil. The squirrels had opened the bottom door. It was right when the hawk flew under it. The weight of the acorns was too much. The Hawk-Devil could not fly in the acorn storm. He dropped to the forest floor. 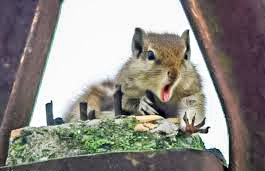 The squirrels from the first fort joined in. They threw more acorns at him. He screamed in pain. The Jays started their chant. And they sang their Jay Song. The hawk could barely move. He almost couldn’t fly. He just crawled away. He was moaning, about how bad he felt. 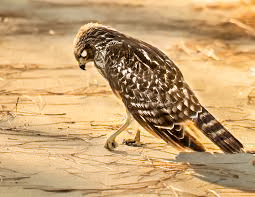 1) What happened when the hawk flew under the bottom door of the fort? a) all the squirrels jumped on him. b) all the Jays attacked him. 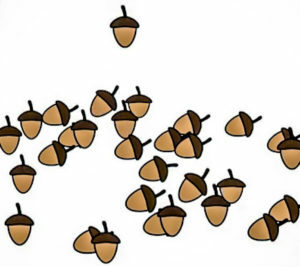 c) a million acorns fell on him. b) dropped to the forest floor. c) attacked the Jays and squirrels.